I started reading this book because Caltech had a new alumni book club starting up, and this was the first book to be discussed. My timing in the reading, however, wasn't so great. I was all SQUEEEEEEEE about reading this book, and placed a hold on the book from the library. The book club started on February 22nd, my loan was due on February 24th. Which is to say, I read the book on the 23rd. As I do. This book is about the math women at what would become, and is, Jet Propulsion Lab in Pasadena. The people who computed. The computers. Of this story, of their tales, I have mixed feelings. The strongest feeling I have is of anger that smart, well-educated, ambitious women can't be engineers because, and only because, they are women. "Let me do all these amazing calculations, but I'm not allowed to design these things, or if I can contribute, my contributions aren't even a footnote in history." Every part of the book about this, about the history of this, is rage-inducing. A close second to this feeling is appreciation. That I would go to college was never a question, of course I would. The question was always, "Which one?" That I was able to go to Caltech is to me these days, somewhat stunning. At the time, my thought was "of course," but that's the arrogance of youth and my ignorance of the world. Probably a good thing on the latter, not so much on the former, because it leads to the third feeling. Sadness. Sadness that this rich history was there, that these women had blazed the path I so obliviously walked. I wish this book had existed when I was at Tech. I might have appreciated where I was an the opportunities in front of me more. Or maybe not. Arrogance of youth and all. I enjoyed this book a lot. The girlie parts, however, were REALLY CONFUSING TO ME. So much so, I had to write notes down about them as I read. My first note was about all the fashion stuff. It bugged me. 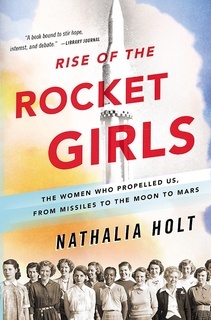 Is this a book about the girls or the rockets or what? I wanted the history of the rockets. And THIS, ladies and gentleman, is a defining feature of Kitt. And one of the reasons I ended up at Tech, and not, say, Pomona. I found much of the random details strange. The fireworks fire was weird. At one point, we hear about the chocolate shake and croissant one of the "girls" had for lunch. Because you remember that detail for a specific day? Did the woman keep a food journal, and have it tucked away in case she was interviewed 40 years later about that day and could tell the author exactly what she had for lunch that day of that one event? Those details pulled me out of the narration a bit. That said, this was a fun read. I am glad this book exists. I am glad these women were able to use their intelligence, interests, and education; that they were able to walk the path, even if they couldn't soar in the skies. This book is worth reading. It seemed incredible that in the midst of her crumbling existence, the world kept spinning and people went on with their daily lives. I understand this. The hardest part about death is that life keeps going. JPL was used to hard-won success born from repeated failure. It didn’t feel like a job; it was more like being part of a secret society. One of the features of the teams I like to build and be on is this element, that you are part of a high-functioning team working towards a common goal, without ego. Careers were rarely a topic of discussion among the women. Their importance was seen as marginal in comparison to their social lives. They couldn’t help but feel that if they were using their own rocket, they would have better luck with it, or would at least be in control of their failures. Employers argued that too many women vanished after taking a leave. Instead, she would use her saved vacation time and sick leave to be home with the baby. When those ran out, she’d come back to the lab. F'ing short-sided asshats. If you'd provide child-care and flexible hours, HEY, they would stay. See above, secret society. The engineers viewed the IBMs with suspicion, while the women embraced the new technology, largely because of their hands-on experience in using the machines. The world of programming kept drawing them in, expanding in both complexity and scope. Yep. Why did we ever relinguish control over this amazing technology? Janet Davis was about to leave too. Fulfilling Dr. Gates’s prophecy, she was eight months pregnant and knew she would have to quit soon. She hid the pregnancy as best she could, wanting to work right up to the end. When a person enjoys what she does, she'll endure a lot to keep doing it. When the news anchor announced that Kennedy was dead, they held one another, in shock and sobbing. They knew that neither the country nor the fledgling space program they belonged to would ever be the same. Debugging a program at JPL in the 1960s simply meant talking through the problems. Margie would sit with Barbara, and they would run through the programs one command at a time. So, rubber ducky debugging? This process still exists, btw. Meanwhile, a manufacturing flaw meant that structural panels began to fall off the lunar module adapter. Sylvia had always loved to travel. Even as a child she felt the lure of leaving familiar places. Returning to JPL and her friends, she was thankful to have no feelings of guilt at leaving her children. Her psychologist had told her this was a medical necessity, and it also helped that so many of her colleagues were working mothers. When Margie struggled with some parts of the program, she did what she had always done—asked the other women. She loved having her friends to rely on. O. M. G. What is this craziness? An environment where YOU CAN ASK FOR HELP? Where you aren't shamed because you're human? What the f, people, can we have one of these f'ing everywhere please? Helen enjoyed being a mentor to the women in her group and wanted more for them, so she came up with a simple plan. She would find intelligent women and get them in the door by hiring them as programmers. Then she would encourage them to get advanced degrees in engineering. While they went to night school, she’d teach them to succeed within the framework of JPL. And this is how you keep women in STEM. Between their aptitude and her guidance, a generation of female engineers would emerge in the lab. Muller was a complainer. He whined that the women monopolized Cora, the IBM 1620. Asshattery knows no gender, btw. Unfortunately for Muller, the women had priority on Cora since they were responsible for 90 percent of the lab’s computer programming. The men were just beginning to dip their toes into the technology, and they lagged behind their female colleagues. Writing the program was so much fun that Sylvia could hardly call it work. She came into the lab each morning excited to get started. Sylvia’s programming made sure the ship swung in line with the movement of the planets it passed, so that instead of using fuel, it would simply be thrown from one planet’s gravitational field to the next. Each step of the elegant dance was carefully choreographed. When Macie hired new women she had often told them, “In this job you need to look like a girl, act like a lady, think like a man, and work like a dog.” In some ways, her advice still rang true. "In some ways" I eyerolled here. In pretty much all ways, unfortunately. While it was a mild day in Pasadena, in Florida the weather was unusually cold. However, after six delays, everyone was eager for the launch to go forward. This whole incident is rage inducing, too, by the way. After the craft had spent five years in storage, no one had thought to check the lubrication and coating on the antenna’s rib apparatus. “They’re always focused on the control room at JPL. The people really doing the work don’t get on TV,” she remarks. In 2008, the fiftieth anniversary of her starting at the lab, JPL changed the rules and dictated that all engineers were required to hold advanced degrees. Because Sue never finished college, they took away her salaried position and switched her to an hourly rate. However, once administrators saw how much overtime she was getting, they made an exception and switched her back.